New York, NY - Igumen Nektariy, abbot of Holy Trinity Monastery in Mexico City was hospitalized Monday, October 12 due to kidney problems. According to schema monk Christophor who is a part of the same monastery Fr. Nektariy was in critical condition for 72 hours: “Even though he is still hemorrhaging, his overall condition has improved,” he wrote. In an email written to the Fund for Assistance in September, Fr. Nektariy related that he had other serious health problems over the summer which required surgery. “We have no health insurance in Mexico, so whenever any of us gets ill we only in the Mercy of God,” he wrote. The aftermath of the swine flu quarantine, as well as numerous medical bills adversely affected the Monastery’s funds. Earlier this year the Fund for Assistance held a collection for the Holy Trinity monastery and disbursed over $7,000. Igumen Nektariy is the only ROCOR priest in the country in charge of a monastery and six Orthodox missions where he serves a continually growing population of Russian immigrants. Fr. Nektariy is a Doctor of Historical Sciences and in addition to his duties as priest and abbot, he serves as administrator at the monastery bakery; and teaches history, art history, Church history and linguistics at the University of Mexico. We ask you to help Fr. 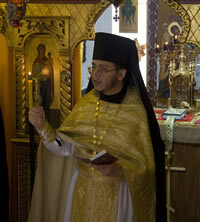 Nektariy pay for his medical bills and assist the Holy Trinity monastery in Mexico!